I would like to find out more information. My grandmother left it to me. I believe she said it from the late 1800s or early 1900s. 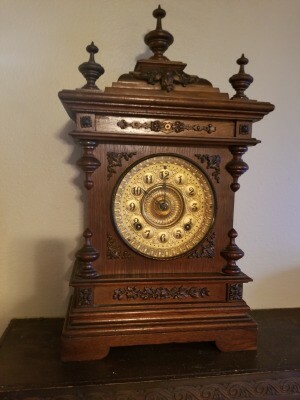 I want to find out the maker, age, and value. There should be a maker s mark engraved on the back, bottom or inside of the clock. Yours looks like an antique, German Junghan's (the brand) clock. Probably walnut. Probably from the late 1880s or early 1900s as you think. Not sure if it is real or a knock off...hard to tell by the photo and only an expert can probably give you the facts. I am not an expert (like an appraiser) just a collector and someone who loves all things old and neat! They are all over the place in value and mostly sell in Europe (so if you are there that is a good thing!). The values on eBay range from 50-150 US dollars. There may be some higher, this is an average. The value depends on it if works, has all the original parts, no cracks in the glass etc. I strongly suggest having a reputable antique dealer look at it and value it (ask for insurance value) which will be higher than retail, but will give you starting place where you can then take best offer if you are trying to sell. I would not try to sell it online (too much of a hassle) so once you are comfortable with the value in your area, see if one of the dealers will sell it for you on consignment!